Swim lessons, school clubs/events, and Hebrew School often mean late dinners where we need to have something quick that the kids will eat. The little guy is especially fussy. Last year while shopping, I saw a grilled cheese Uncrustables variety that we bought. These are great for quick meals at home, but not on the go. 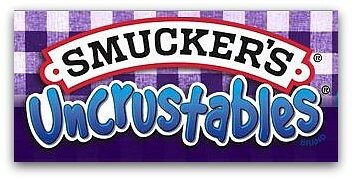 Thanks to Mom Central, I heard about the new Smucker’s Uncrustables and signed up for their Blog Tour. We received a coupon and bought a package of the new PB and grape jelly on whole wheat Uncrustables. I think we would have preferred the ones with strawberry jelly, or perhaps the PB and honey. Still, the grape jelly ones were good. I liked that they were easy to prepare and contain trusted ingredients for my family. I can already see us getting a package and tossing them in the car for our amusement park trips. It will be a nice easy, cost effective lunch on the go. Since they will defrost while going, they are perfect for road trips and even brown bagging field trip lunches for school. I know we will be buying these again in the future. 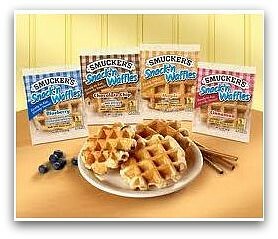 We were also sent a coupon for a new product from Smucker’s called Snack’n Waffles. We have not been able to find these locally yet, but I hope to soon. The waffles are ready in 15 seconds in the microwave and come in the four varities above. Once we try them, I promise to update. Thank you Smucker’s for helping to make family life a little easier with some items that are convenient for families on the run. Disclosure: I wrote this review while participating in a blog tour campaign by Mom Central on behalf of Smucker’s and received products necessary to facilitate my review. In addition to this, I received a gift certificate to thank me for taking the time to participate. All opinions are 100% mine and in no way influenced.